The Bertschi School Science program lives and grows in this amazing building. Come inside with us and explore the elements that make this a "Living Building" and a great place to learn Science! The Bertschi School Living Science Building was designed by intense collaboration between Bertschi students and staff, and KMD Architects Restorative Design Collective. The site is located on the north side of an urban campus in Seattle, Washington, USA. Through a series of interviews, the team learned what the students wished for in their new learning space: "an indoor river, a bamboo fountain to relieve stress, and green house where something’s always growing". Architects, landscape architects, engineers, and other consultants paired these requests with the rigorous standards of the Living Building Challenge v 2.0 (LBC) to design a 1,425 sq ft science classroom building on a 3380 sq ft site with an ethnobotanical garden. The Living Science Building was completed in February 2011. Construction began with removal of a paved playcourt and installation of underground cisterns. Next the building was constructed, consisting of R-52 wood-framed walls and structural insulated panel roof with insulating curtain walls. Hydronic radiant floor heating, an energy recovery ventilator, and natural ventilation contribute to reducing energy consumption. All materials used in the building are Red List compliant, all wood is (Forest Stewardship Council) FSC certified, and 98-100% of waste from the construction process was diverted from landfills. Carbon emitted from construction processes was offset and three acres of undeveloped land was set aside for habitat preservation. All the sustainable features of the building are visible and functional for students to learn ecological concepts that can become intrinsic values for future generations. 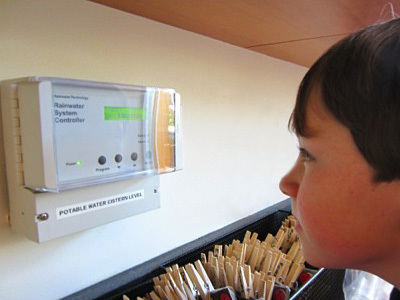 Because the building must have net zero water and energy usage, students participate in real-time monitoring of the building's energy use and production, as well as the water usage and collection. 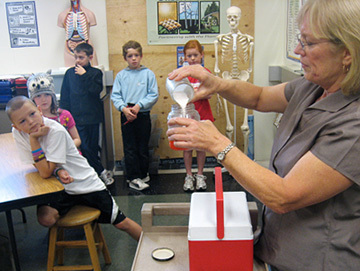 Daily operations, systems monitoring, and maintenance are carried out by the Science teacher and facilities staff, with help from students and volunteers. All building energy comes from photovoltaic production. A 20-kilowatt PV system on the roof of the adjacent building provides electricity to the grid-tied building to achieve net zero energy on an annual basis. Water needed for the building is captured rainwater for all non-potable uses. City water is provided at the classroom sinks due to code requirements. Net zero water is achieved through a variety of methods including cisterns for storage, an interior green wall which treats grey water, and a composting toilet to treat black water. 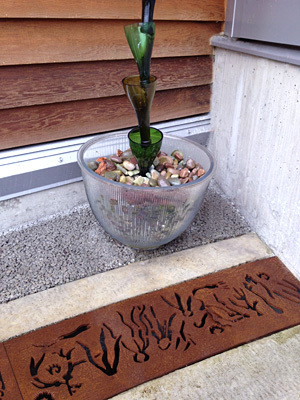 Excess captured water is absorbed by the on-site rain garden. The Science Wing completed its performance period in November 2012 and was fully certified as a "Living" building by the ILFI in April 2013. 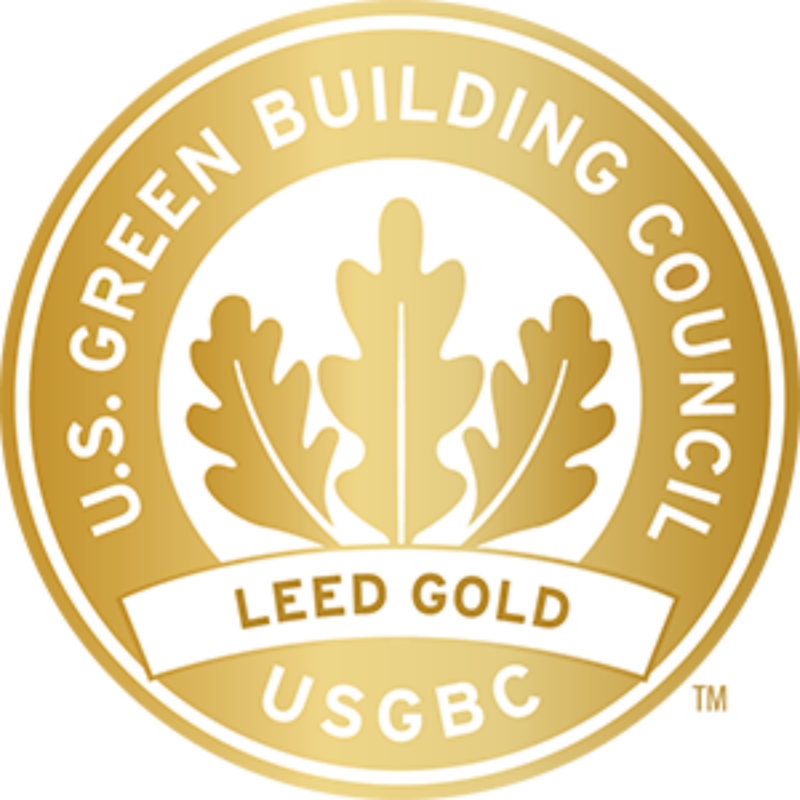 The International Living Future Institute (ILFI) - Organization that oversees the Living Building Challenge, the built environment's most rigorous and ambitious performance standard. Cascadia Green Building Council - Local chapter of the US Green Building Council and partner organization to the ILFI. Healthy Building Network - Works to provide environmental justice through sustainability in the architectural and construction industries. 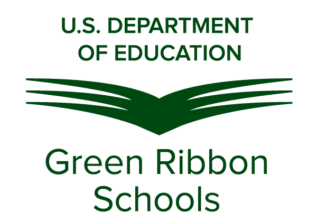 Washington Green Schools - Challenges students and school communities to create a sustainable region through educational experiences that transform school environments. 1. Rain water falls onto the metal butterfly roof of the Science building and the adjacent Church building roof. 2. Water flows off of the roofs, through the downspouts, through the runnel in the classroom floor, and into the undergound cistern in the EcoHouse. 3. The EcoHouse cistern fills with water. It has a capacity of 2200 gallons. 4. Once the EcoHouse cistern is full, the water overflows into the exterior runnel. 5. From the end of the runnel, the water travels through an underground pipe to fill the irrigation cistern located underground in the garden. 6. Once the 2500 gallon irrigation cistern is full, the water backflows into the exterior runnel and overflows into the rain garden. There it soaks into the ground. 1. Potable water flows from the cistern or City source to the classroom sinks. 2. Used water (now considered grey water) drains from the sinks and into the grey water tank in the cabinets below the sinks. 3. When the grey water tank gets full, or at least once every 24 hours, the tank pumps the water to the green wall in the EcoHouse. 4. The plants and the soil of the green wall take up the grey water and use it to feed the plants. The plants then release the water into the air in the form of water vapor through a process called evapotranspiration. The building's ventilation system then releases the moist air to the outside. 5. Any water that is not absorbed by the green wall is cycled back through the system and onto the wall again. Because the wall can only use a limited quantity of water per day, the students must pay close attention and not overuse water at the sinks. 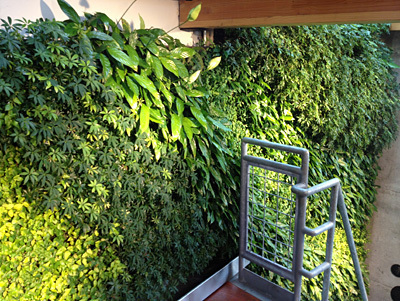 The 165 square foot vertical green wall is used to treat all of the grey water produced by the building. The grey water is delivered to the top of the wall through a drip irrigation system after being pumped from a grey water collection tank. Water flows down the wall and is used by the plants. Rain water from the irrigation cistern is also pumped to the wall as needed to supplement the grey water. The GSky green wall consists of one-foot square, four-inch deep stainless steel boxes that contain a growth medium. The densely planted green wall contains four varieties of plants that are hardy for the conditions presented, including: indoor growing conditions, large variations in the amount of water they receive, and variations in temperature and light. The wall must remain healthy throughout the year to treat the grey water produced by the science classroom and lavatory so it is closely monitored and maintained. The green wall in the EcoHouse adds much to the building beyond its primary use as a method to treat grey water. The plants absorb CO2 and produce oxygen, adding to healthy air conditions while promoting well-being. The natural shapes and human-nature relationships provided by the wall make it an important part of the project serving multiple purposes. 1. 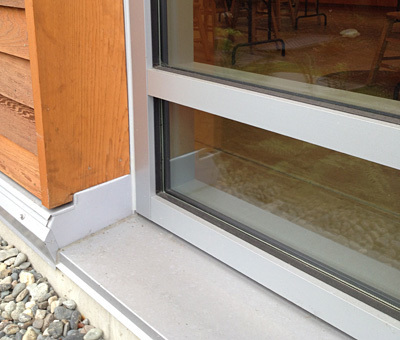 Cool, fresh air is drawn in through an exterior vent in the EcoHouse wall near the green roof. 2. 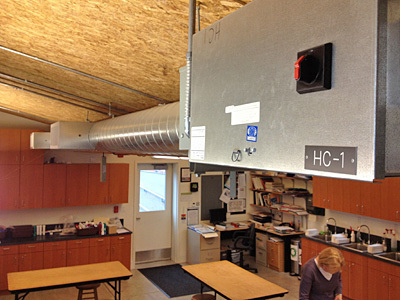 The cool air passes through the ERV where it exchanges heat with the classroom air exiting. 3. The now somewhat warmer fresh air then passes through an electric tempering chamber that heats the air to near room temperature. That unit is labeled HC-1 in second picture at left. 4. 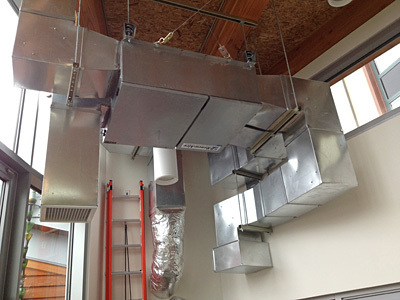 The fresh air then is distributed through a duct and ventilation louvers into the classroom area. 5. As fresh air enters the classroom, the used warm air is drawn out of the classroom through a return air duct and sent back through the ERV. 6. 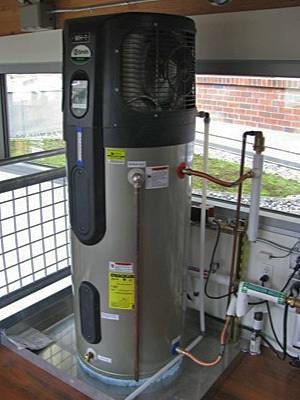 The ERV removes some of the heat from the used air and exchanges it with the cool fresh air entering in step two above. 7. Having given up much of its heat, the used air then exits into the EcoHouse. There it exits from a vent in the upper corner of the room after passing along the green wall. This air cycle benefits both spaces in that fresh preheated air is distributed to the classroom to provide a comfortable and well ventilated space while CO2 rich and humid air is provided to the EcoHouse where the plants can benefit from it. This relationship saves energy because of the transfer of recovered heat from the classroom and common flow of air from a single system for ventilating both rooms. Both the classroom and EcoHouse also have operable windows and skylights that provide ventilation and fresh air during the more temperate months of the year. The Science Classroom is heated with a hydronic radiant floor. Electricity from solar panels powers a hybrid water heater. The heated water is pumped through tubes in the floor and heats the concrete. 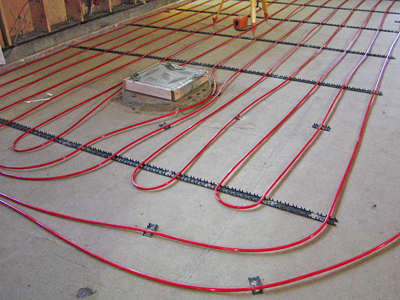 Radiant heat is even and efficient because the large mass of the concrete floor, once heated, provides a continuous source of heat rising from the floor into the occupied zone of the room. At left is an image of the heated floor taken with an infrared camera. 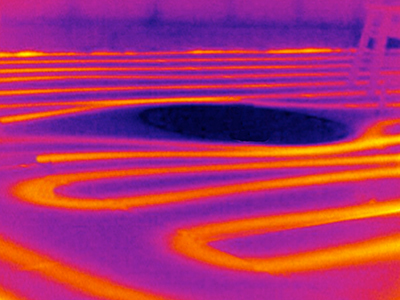 The heated water tubes are visible as a warmer area of the concrete as seen in the infrared wavelength. Notice the dark area in the middle which is the manhole cover as seen in the upper photo. The Science Wing has two sections of flat roofs totaling 522 square feet. These roofs are covered with a moss matt green roof system from Xero Flor. This low profile system uses a moisture retaining fleece, root barrier, and about one inch of soil. 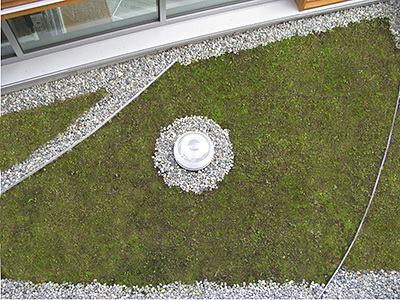 The system installed here uses a variety of mosses on some sections of the roof and sedums on others. These plants were chosen because the roofs remain in the shade much of the time due to the height of the adjacent building. The mosses and sedums are also able to handle the wide variation in moisture available, from the near constant soaking during the fall and winter months, to the sometimes extended periods without rain in the summer. Green roofs are beneficial in many ways through: stormwater retention, energy savings, a return of green space lost during development, wildlife habitat, production of oxygen, and natural beauty. These green roofs are planted with a curving pattern to further enhance the connection to nature through natural forms. The Science Wing has two rain water cisterns; one inside and one outside. Both are concrete cylinders below ground, and are lined with a non-toxic cementitious water proofing material. Inside the EcoHouse is the 2200 gallon potable water cistern. Rainwater enters this tank from the interior runnel and can be used to make potable water through treatment equipment on site. 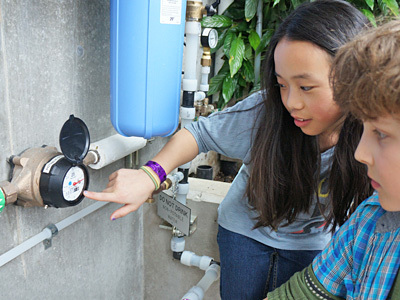 The water can also be hand-pumped and used to water plants in the EcoHouse. When this tank fills to capacity, water overflows into the exterior runnel where it makes its way to the irrigation cistern. The irrigation cistern, located in the garden, stores 2500 gallons of rainwater. This water is used for multiple purposes, including: toilet flushing, green wall supplemental irrigation, and irrigation of the ethnobotanical garden. There is also an exterior hose bib on the building that provides rainwater from this cistern for hand watering plants and for maintenance uses. 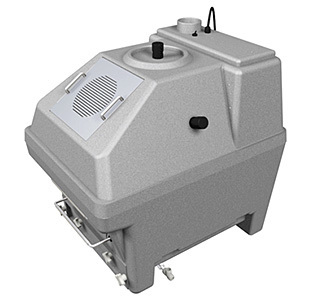 The tank has a submersible pump and float switches to control the water levels in the tank. 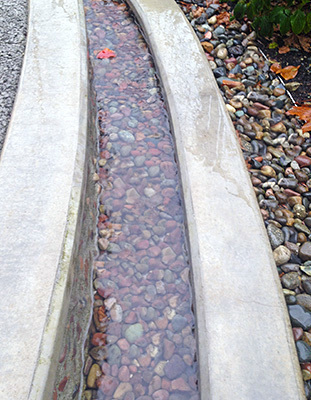 When the tank is full, the excess water flows back into the exterior runnel and overflows into the rain garden where it soaks into the ground. The exterior runnel starts at the north wall of the EcoHouse where several water sources come together to feed it. Water overflowing from the potable cistern inside joins water from the two green roofs and water from the stairway drain to flow around the curve of the runnel. At the end of the runnel, the water flows into the fountain basin and through a six inch pipe to the irrigation cistern. Once that cistern fills, the water backs up into the runnel and overflows into the rain garden on the north side of the runnel. The arc of the runnel surrounds an outdoor classroom area made of porous concrete. 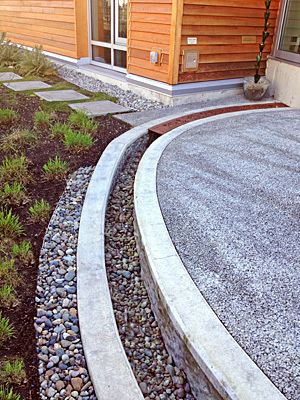 This type of concrete has a porosity similar to soil and helps to control stormwater runoff. 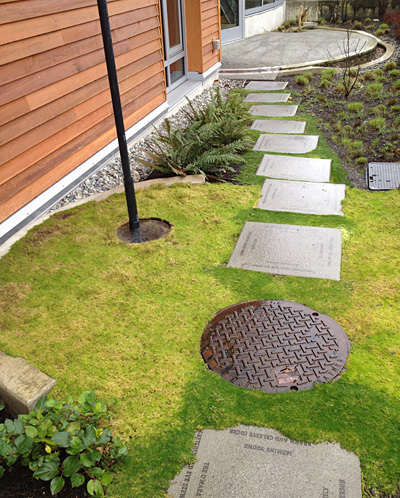 This allows a hard surfaced area to be used without causing unnecessary runoff. The EcoHouse has a hand pump for pumping water from the potable water cistern. 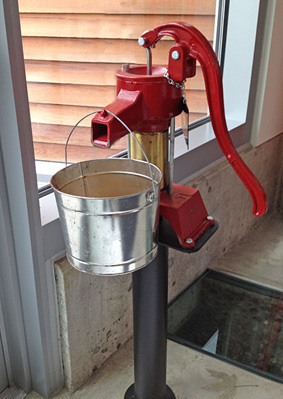 The pump is similar to mechanical pumps found in many places where water is pumped by hand. It requires priming and pumps approximately one half quart per pump. 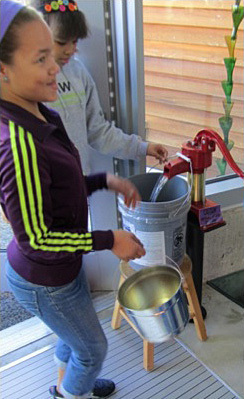 Students use this pump to fill containers to water plants in the EcoHouse for their plant studies. They also pump water for measurement experiments. Another important learning program that the students take part in is the Water First program that teaches them how people in many countries have to carry water great distances every day for their basic needs. The Science Wing has one unisex restroom with a composting toilet. The system employs a vacuum flush Envirolet composting system consisting of a toilet unit, vacuum/pulverizing unit, and two composting waste storage tanks. The dual tanks add capacity and allow for an average of fifty flushes per day. Each flush uses approximately one pint of rain water. 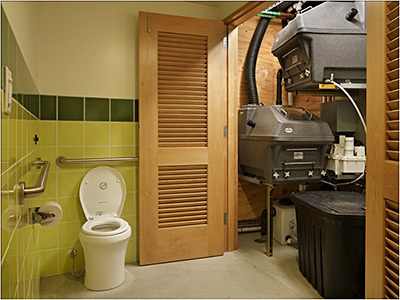 This system was chosen due to space constraints and the inability to have the composting unit directly below the toilet. While the vacuum system solves the space and location problem, it uses more energy than a gravity type composting system because of the need to move waste under vacuum and the additional heat required to evaporate the water required to flush. The Science classroom and EcoHouse are light filled spaces. Even though the Science Wing is mostly in the shadow of a taller building, the generous windows and skylights provide wonderful north light. The views from these windows are onto the garden and the open sky which adds a sense of space and a connection to nature from within the building. In addition to light and views, the windows play a vital part in the ventilation of the building. 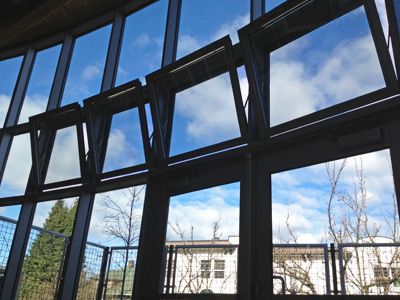 In temperate weather the operable windows in the classroom and EcoHouse are open, allowing fresh air to circulate and cooling to occur. This saves energy and makes for a better indoor experience for the students. The Science Wing walls are constructed from 2 X 12 wood framing. 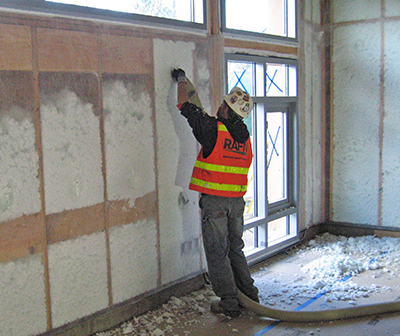 These extra thick walls provide more space for insulation to achieve an insulation value of R-52. Blown-in cellulose insulation fills the wall cavities providing not only a high level of insulation for heat loss, but also an excellent sound barrier. 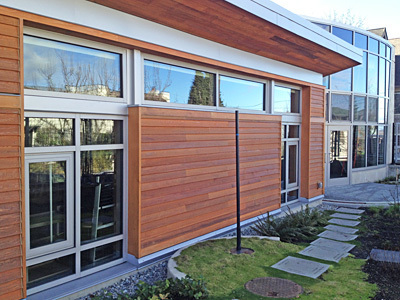 The highly insulated building envelope and tight integration of walls, windows, and doors contributes to the building's ability to achieve net zero energy. The wood framing material in these walls is all Forest Stewardship Council (FSC) certified which means it comes from sustainably harvested sources. The cellulose insulation is natural plant fiber with post-consumer content. As with all of this project's materials, these wall components are appropriately sourced from local sources which contributes to the regional economy and reduces embodied carbon footprint by limiting the energy required for shipping materials. The Science Wing is powered by a 20.1 kW solar array made up of 90 photovoltaic modules (panels). This array provides the power for everything in the Science Wing from heat, to lighting, ventilation, and all power outlets. The array is spread across the roof of the two adjacent buildings to the south. This allows the Science Wing, which is in the shadow of one of those buildings, to be powered by the sun. In the photo above, all of the solar modules except the 24 in the lower right corner are part of the array for the Science Wing. The additional modules provide power to the Bertschi Center building. 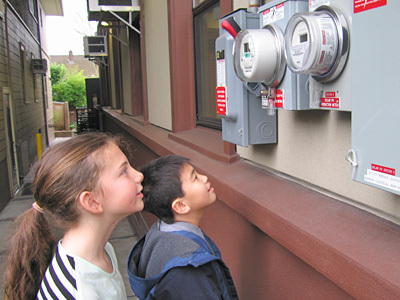 The solar array is tied to the City of Seattle electrical grid and takes advantage of the City's net-metering connection. This means when our system produces more energy than the building uses, the power flows back into the grid and we get credit for that power. Likewise, during winter months when we use more than we produce, we draw power from the City grid. 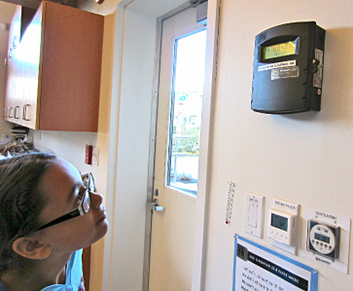 Our energy usage and production are both monitored and recorded by devices on the building and by our 5th grade students. Net zero energy is achieved when the building produces as much or more power than it uses when averaged over one year. Each of the 90 modules of the solar array has an Enphase microinverter mounted to the module. These microinverters convert the DC power produced by the solar module to AC power right at the individual module rather than in a large single inverter. This makes the system more efficient since AC power has less loss in transport than does DC. The individual inverters also allow each module to produce power separately from the others which means greater reliability, efficiency, and the ability to monitor each individual module through a web interface. You can view live and historic data for this solar array through the Enlighten website. Bertschi 4th graders study water: watersheds, the water cycle, pollution, conservation, and the life cycle of salmon. The northwest is home to five major salmon species and they are an important part of our heritage and economy. They are also an indicator of the health of our environment, from the fresh water spawning grounds to the oceans where the salmon spend their adult life. 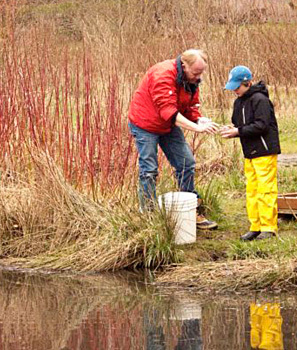 Each year the 4th grade classes and our Science teacher Julie Blystad visit the Issaquah fish hatchery. There they learn about salmon and efforts to preserve them. They also get to see large mature salmon that have returned to spawn. 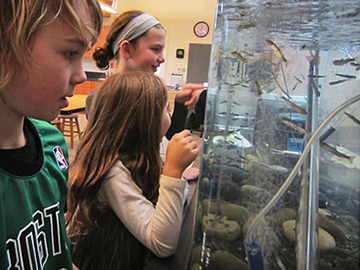 The hatchery provides the 4th graders with eggs and milt from spawning fall chinook salmon. Back in the Science classroom, Julie pours the milt over the eggs to fertilize them. The eggs are then placed in a tank full of cold, clean, well oxygenated water; just the right conditions for young salmon. 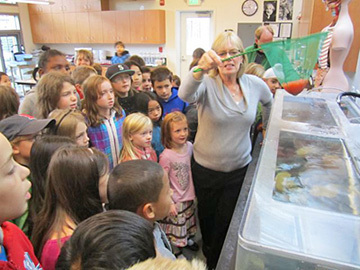 Over the next 12 weeks the students watch as the salmon eggs change from eggs to fry. 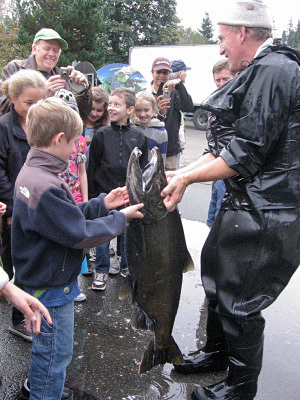 The students then release the salmon into Lake Washington . The young salmon will stay in the fresh water for a few months before heading out through Puget Sound to the ocean. 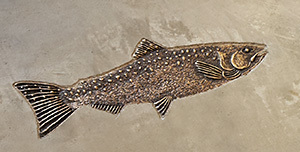 In a few years the adult salmon will return to this watershed to spawn, repeating the cycle that has been going on here for millennia. The Science Wing has numerous monitoring and control systems throughout the building. Since the building must maintain a net zero water and energy balance, it is important that we can track usage and production of these resources. 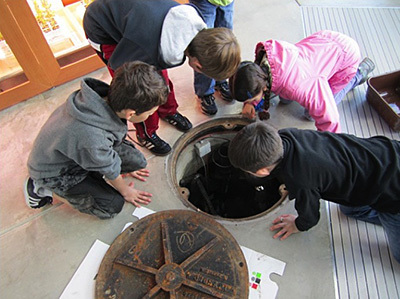 As part of the Science curriculum, Bertschi 4th and 5th graders monitor and record these things with the help of the instruments in the building.